Thought experiments have been the bread and butter of modern physics since its inception. Galileo used a thought experiment to argue that all objects fall at the same rate regardless of mass, Isaac Newton used a thought experiment to argue for the absolute nature of space, Maxwell used a thought experiment to argue the nature of thermodynamics, and Einstein’s original paper that introduced the special theory of relativity was purely a thought experiment. Quantum mechanics has a long history of thought experiments, most geared towards pointing out weaknesses or oddities in particular interpretations of quantum mechanics. The newest addition to this history of thought experiments in quantum mechanics adds to this tradition by arguing that the common understanding of quantum mechanics is incorrect. 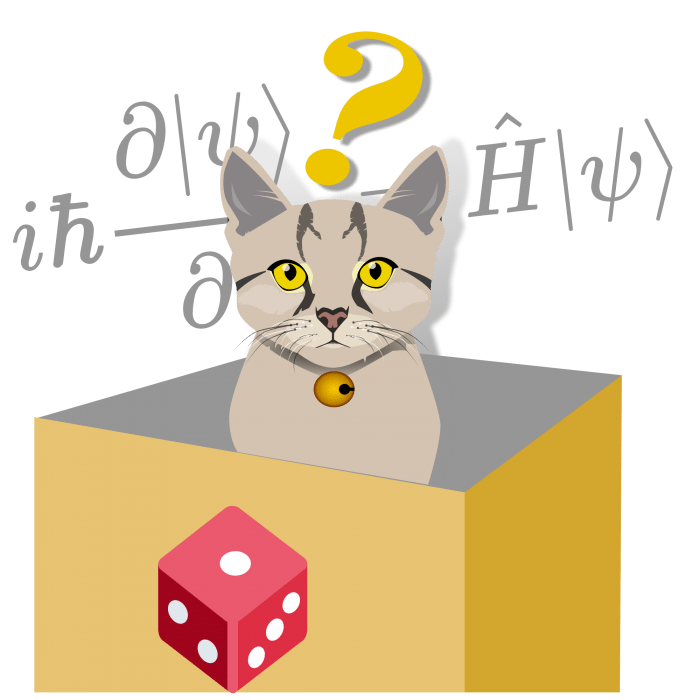 In a new paper published in Nature, physicists Daniela Frauchinger & Renato Renner present a thought experiment meant to point out an inconsistency in the orthodox interpretation of quantum mechanics. 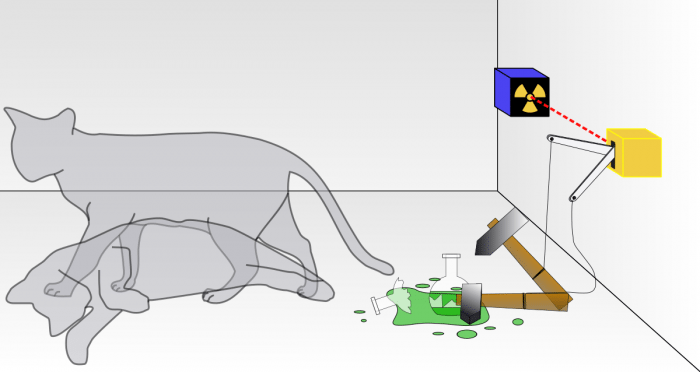 The particular thought experiment presented by the authors is a modification of one given by Eugene Wigner in 1961, which itself was a modification of the infamous Schrödinger’s cat thought experiment. 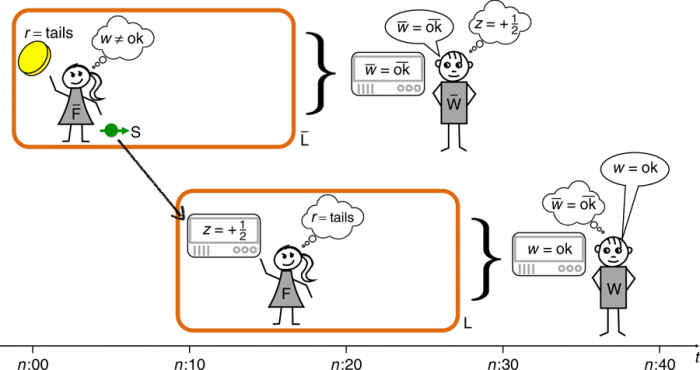 Frauchinger & Renato’s setup involves two scientists making measurements on two friends who are each making measurements on an isolated quantum system. Their argument, in a nutshell, is that if the orthodox interpretation of quantum mechanics is correct, then the two outside observers will reach contradictory conclusions about the state of an experimental system. 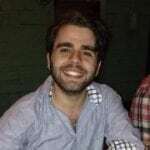 Contradictions are a no-go in physics so, therefore, something must be wrong with the orthodox interpretation and we should replace it with another. 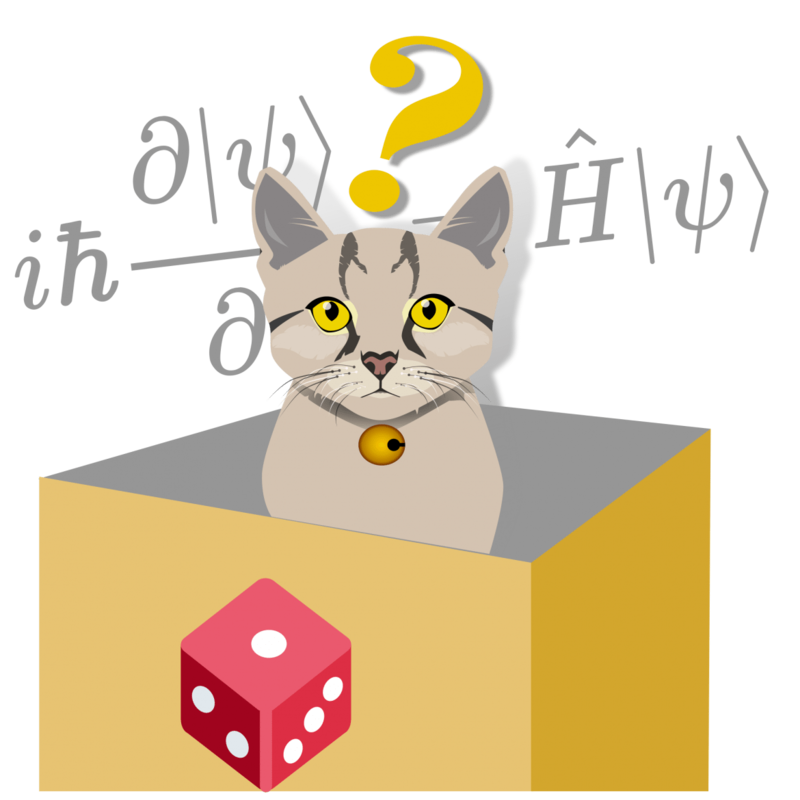 In 1935 Erwin Schrödinger presented the following thought experiment: Say you have a box with a cat in it. Inside the box along with the cat are a vial of cyanide and a hammer rigged to break the vial, releasing the gas and killing the cat. The vial/hammer apparatus is itself wired to a Geiger counter, set up to detect the radioactive decay of a cesium isotope. If the atom spits out a beta particle, the hammer will break the vial killing the cat. If the atom does not spit out a beta particle, nothing will happen and the cat remains alive. You leave the box alone and come back an hour later, wondering whether the cat is alive or dead. Well, according to the orthodox interpretation of QM, also known as the Copenhagen interpretation, the answer is actually neither. The mathematical framework of QM describes the above set up as being in a superposition, a mixture of classical states: one in which the atom decayed and the cat is dead, and one in which the atom did not decay and the cat is alive. Before one actually opens the box to look, the cat is in a superposition of alive/dead. When an actual observation is made, the superposition “collapses,” causing the system to pick one definite state. Thus, the Copenhagen interpretation holds that observation of a quantum system causes that system to collapse from a superposition of multiple possible states into one definite state. (It is interesting to note that Schrödinger himself thought his hypothetical situation proved that the orthodox interpretation was absurd). In 1961, Eugene Wigner offered a modification of Schrödinger’s gedankenexperiment. Wigner’s thought experiment replaces the cat in the box with a fellow scientist in a lab who themselves is measuring a quantum system S. Outside the lab is Wigner himself who is observing the entire system of the lab; his friend plus system S. The friend in the lab makes a measurement on an electron and records that it has a spin of -1/2. From the perspective of the friend in the lab, the wave function of system S has collapsed and given him a definite measurement. However, from the perspective of Wigner outside the lab, the entire lab, which includes both his friend and system S, is still in a superposition of two states, one where the electron was measured with a spin -1/2 and his friend observed -1/2, and one where the electron was measured with a spin 1/2 and his friend observed 1/2. It is only after his friend in the lab tells him the result of his experiment that the entire system of the friend plus S collapses into a definite state. From the perspective of the friend inside the lab though, the electron has already taken on a definite state as soon as he measured it. Many have held that Wigner’s thought experiment proves that QM is not applicable at all scales of reality. Frauchinger & Renner’s modification to Wigner’s thought experiment is meant to highlight an inconsistency in the orthodox interpretation by deriving an outright contradiction from the principles of the Copenhagen interpretation. Essentially, the thought experiment shows how four individuals each with a different piece of information following rules dictated by QM will result in contradictions. In the pair’s setup, there are two friends F and F each inside of labs L and L making measurements, each being observed by scientists W and W respectively. F flips a coin, and depending on the result, polarizes a particle S to have a certain spin. She then communicates this spin result to F who uses her knowledge of quantum mechanics to determine the outcome of F’s coin flip. So far so good, as F and F are in agreements about the outcome of the coin flip. Now, W and W enter the picture. Depending on the initial measurements made by F and F, W and W will observe L and L as being in particular superpositions. Depending on the result of the initial coin flip and the message sent from F to F, a situation will arise where W and W can, according to the mathematical rules of QM, be absolutely certain about the outcome of the initial coin flip. The only problem is that W and W will disagree about that outcome as being heads or tails. In other words, the rules of the orthodox interpretation require that W and W both be 100% certain about the occurrence of mutually exclusive outcomes, a blazing contradiction if ever there was one. Frauchinger & Renner point out that a contradiction arises only if one assumes a “single world” interpretation of QM; that there is only one reality where only one outcome can definitely occur. In a previous paper, Frauchinger & Renner have argued along similar lines that single world interpretations of QM will inevitably end up producing contradictions. According to “many-worlds” interpretations of QM, there is no collapse of wave functions; for every possible value of some variable, there is a branch of the universal wave function where that outcome actually occurs. So if a many worlds interpretation is true, then the apparent contradiction derived above is no true contradiction after all. W and W’s observations are consistent as they each describe a different branch of the wave function, a branch where different outcomes occurred. Frauchinger & Renner argue that considerations like their thought experiment compel us to adopt a many-worlds interpretation, as it is the only one that can reconcile the contradictions apparent in the orthodox view. Many-worlds interpretations of QM have gained a lot of popularity in recent years but are understandably still handled with some apprehension in the scientific community. The entire premise of the many-worlds interpretation seems impervious to experimental testing, as any possible experimental result could be explained away by referencing the branching nature of the universal wave function. However, strict logical and a priori analyses like that given by Frauchinger & Renner seem to give a kind of evidence for a many-worlds interpretation, on pain of reality being genuinely inconsistent; something no scientist would want to believe.